Phlox paniculata Top Shelf 'Strawberry Daiquiri'. This compact variety features intensely deep red flowers over dark green foliage. 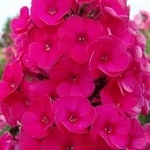 Outstanding... you get a dwarf Phlox with strong, compact stems topped with numerous flower clusters densely packed with florets of overlapping petals up to 1.5 in. in diameter... and mildew resistance! Did we mention the strong, sweet fragrance of the flowers? Another "Top Shelf" import from Europe. PPAF.